For many, few events in life are as exciting and rewarding as buying a new home. Becoming a homeowner gives you the opportunity to create the space you’ve always wanted. 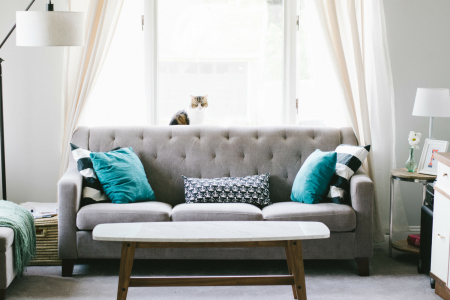 Here are some tips to help you personalize your new place and make it your own. One of the first things you’ll likely want to do is deep clean the whole house. This gives you peace of mind knowing that it’s been cleaned to your own personal standards. You’ll feel ready to get comfortable and start decorating once it’s scrubbed, dusted, and freshened up. If you aren’t ready to commit to a design scheme in bedrooms or the main living areas of the home, start out small. Focus on freshening up the bathrooms with new decor and little detail changes. Even basic items like the shower curtain and towels can make a difference and give the bathroom a more personal look and feel. After tackling a small space, you may find the inspiration that you need to move on to the other rooms. An easy way to make the home feel more personal is by making small changes, like switching out an old light fixture or installing a new faucet. These little details can give the space an updated look. You’ll be able to choose fixtures and finishes that you like, rather than simply sticking with the ones that are already installed. If you aren’t entirely sure what direction you’d like to take the design in a room, remember that there’s no rush. Look for inspiration before committing to a particular style or scheme. Don’t spend money on decor items and furnishings that you don’t truly love. Take your time when selecting the furniture pieces you want to accomplish a comfortable, stylish, and functional design in every area. When you’re a homeowner, you have free reign to paint the walls any color your heart desires. Give rooms a fresh and unique look by choosing paint colors that inspire you. If you aren’t sure about the colors for every room, take your time choosing. Start by painting the areas you are sure of, even if it’s just an accent wall. One easy way to personalize your home is by adding framed photos to walls and shelves. Consider creating a gallery wall featuring your favorite family photos in unique frames. You can also mix in artwork to give the wall an artsy and stylish look. When you move into a new home, there are many ways to add your own personal touch and make it truly feel like your own. Something as simple as a fresh coat of paint or a few framed photos can go a long way. You may not have the time or money to decorate every room right away, but over time, you’ll be able to achieve the look that you want. If you’re interested in buying a new home or selling your old one, contact our office and we can help!